So you’ve planned out your wedding budget and you’ve organized your wedding attire – now it’s time to tackle your wedding registry. This is one that I find the bullet journal excels at. First of all, you should be warned that creating a registry is more exhausting than it might seem. It’s more than just picking out some stuff that you want. It’s a big step for collaborating with your sweetie in a way you likely haven’t before and building your future home. If you have lived with your soon-to-be spouse before, it should be a little easier because you have already mixed your possessions and compromised with each other on whose bed set to keep and where that lamp should go. If you haven’t lived together before, this might be a bit bumpier. But don’t worry! Making a registry is fun overall, if a little stressful, and you should enjoy picking out items you want to share together in your new lives together. Before you run to your nearest store or start digging through Amazon’s endless wares, I would suggest taking stock. 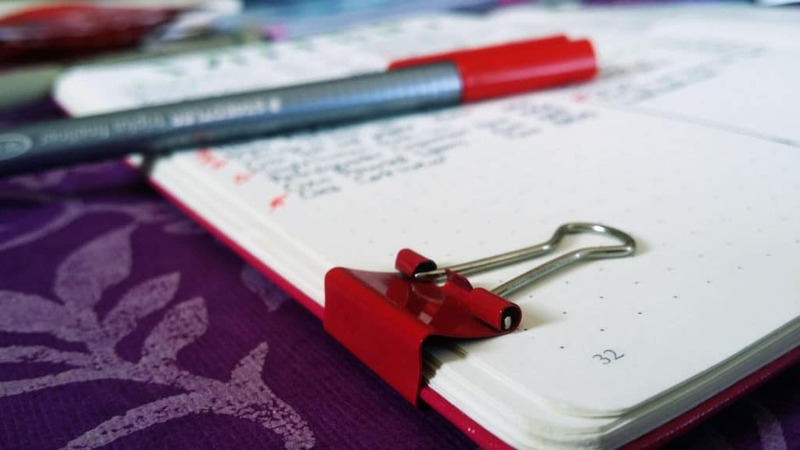 Walk around your home with your bullet journal and devote a page or two to scribbling down items that you need or want. Rummage through your kitchen cabinets, closets, and bathroom. Don’t forget about the bins in the garage! Is there anything tucked away that you had been saving for your new home? Jon and I lived in his parents’ basement for a few years to save money, so we had several bins of kitchen and bathroom stuff that needed to be sorted before we could get a full idea of what to put on our registry. Also, take into account any other circumstances, like moving. Jon and I moved out of state only two months after our wedding, so we picked registry items with the move in mind. We actually asked our guests to consider gifting us cash instead of objects so we could furnish our apartment accordingly, since we had little idea of how our stuff was going to fit into the new space we were moving to. And this is ok! I am so glad we did this, and if any of our guests got huffy about it, I didn’t hear of it (and I really don’t care). So consider a tasteful request for cash gifts if your situation doesn’t call for more stuff, like if you and your sweetie have lived together for a while and already have everything you need. If you are uncomfortable asking for cash directly, consider asking for people to contribute to your honeymoon/house/moving fund. It sounds a little better if the money is clearly going to a specific thing. If you don’t want to do this, that’s ok, too! Just try to remember that you are living in the modern age and you don’t need to ask for a bunch of stuff you don’t need just to please the more traditional members of your family. More stuff can easily be more stress. I used two stores for my registry: Amazon and Bed, Bath, & Beyond. This was primarily because we wanted to cater to anyone uncomfortable with shopping online, and BBB has pretty great wares. Obviously, use any store you want. But I will say that you should definitely use Amazon’s Wedding Registry on top of whatever other stores you use. They have an enormous selection, an intuitive registry feature, reviews at your fingertips, and a competitive registry completion program. And it is super easy! You can do it at home in your jammies sipping wine or while you are standing in line at the coffee shop. We have nothing but positive things to say about our experiences with Amazon. And on the same vein of asking for cash instead of objects, you should note that you can even register for Amazon gift cards, which is basically the same thing as cash. So that might be a nice middle option for the people who think that asking for cash is tacky. And if you like Amazon’s wedding registry (which you will), you might want to check out Amazon’s baby registry. I haven’t used it myself, but if it is half as useful as the wedding registry, it is definitely worth your time to set it up. If you haven’t started your registry yet, you should do it now. Yes, now. It’s easier to add things as you think about them than trying to cram them all into your registry in a hurry. Believe me, this takes time. Jon and I had heard that filling a registry would be hard, but we had no idea how hard it actually was. One of the things that makes it so tough is that you want to have about twice as many items on your registry as you have guests so they have a broad selection. You want to also make sure to have items at many price points so people aren’t stuck between a $500 vacuum and a $10 napkin ring set. So start early, even if you are two years out. You don’t need to share it with anyone until you’re ready. Your guests will appreciate your thoughtfulness. Now on to bullet journal business! 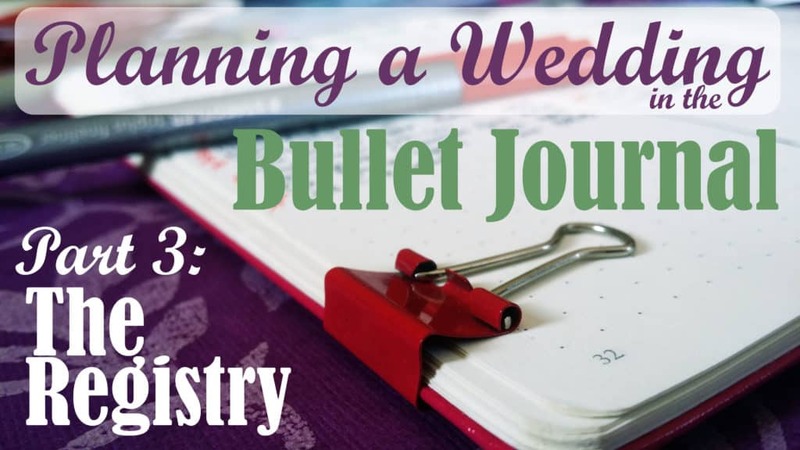 After you have taken stock and you are ready to begin adding items to your registry, open up a spread in your bullet journal and title it Wedding Registry. I separated my spread into four columns, but if you have more than two stores, you may want to ditch the columns and keep it at two pages. I like the Leuchtturm for this because the dot grid makes formatting this spread a breeze. And I used Micron pens to help add some nice dark, thick lines- I’m a sucker for strong lines. Make sure you give yourself room to grow! You will be adding plenty of items, so you don’t want to find yourself out of space. Maybe use the thin lined pens from the Micron set to write smaller if you expect lots of items. 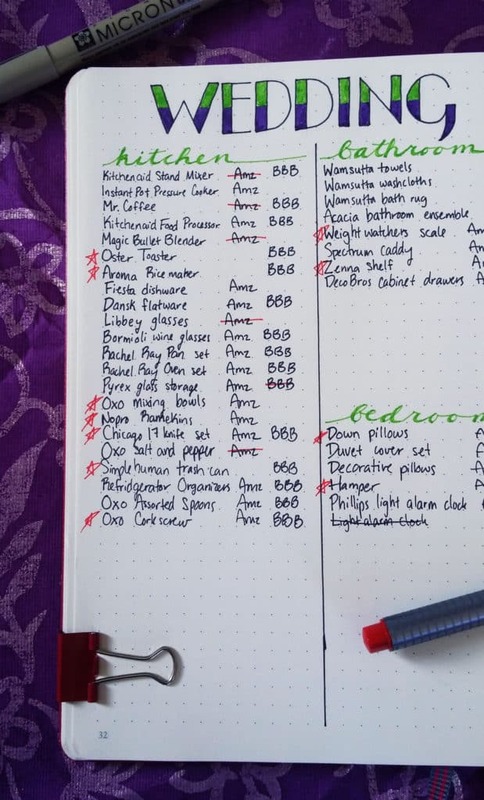 Write out little headers for each category of item. For me, I had kitchen, bedroom, bathroom, living, and leisure. You could add a cleaning category if you’d like (I just shoved those under living). You might want to consider the Staedtler Triplus Fineliners for two reasons: you can color code price points if you wish (though I didn’t here) and you can use your wedding colors (which I did do here and it’s cute as a button). I actually added in a straggler- my purple Prismacolor marker because someone doesn’t have purple in the set of 10. But I digress. 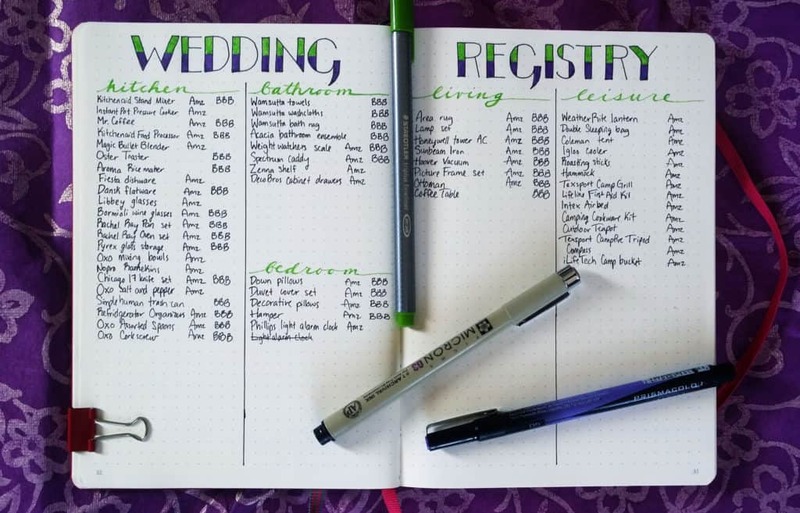 Write out each item and the registry it belongs to. I wrote abbreviations for the stores next to the item. You’ll notice that we actually had many items on both registries. We didn’t have enough items to sufficiently populate either registry, so we doubled up to make both registries look less scarce. 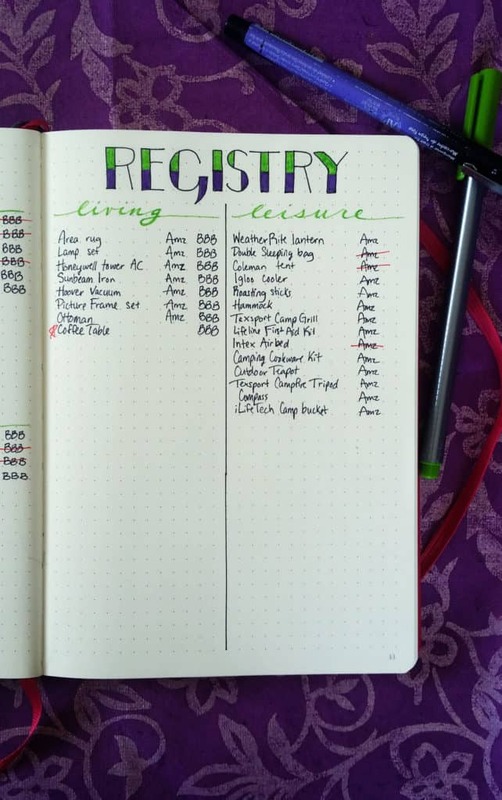 If someone buys an item from one store, simply delete the extra from the other registry and make the bullet journal reflect that. I crossed off the store that the item was bought from. And if someone does buy a duplicate, Amazon (and probably most stores) has an excellent return policy, so you don’t need to worry about it at all! 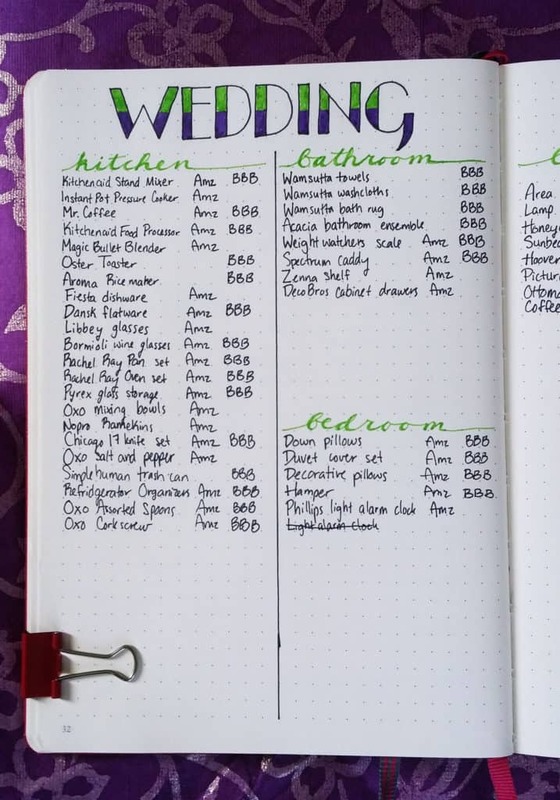 As more people buy more items, you will keep track of them in this manner until your wedding day. Technically people have several months to get your wedding gift to you after the wedding itself, but no one did that for us. I’m not sure that people really do that much anymore, so I wouldn’t worry about it. What you should focus on after the wedding is your registry completion. BBB and Amazon both had great registry completion programs. Basically, a registry completion program is a discount on anything remaining on your registry after the wedding. Amazon is especially awesome because you get a 10% discount on everything, including items not on your registry. Put a star next to items that you want to buy if no one else gifts it to you. Some items, like the camping equipment, were there in the hopes that someone would buy them for us because there was no way we could get all that ourselves. So determine how much money you would be willing to spend on remaining items, do your research on the registry completion programs, and pick your keepers. I didn’t picture it here, but I scribbled out a page of the prices of our chosen items at each store, assuming that they were available at both stores, and factored in the discount to see which completion program gave us the best deal. This let us save as much money as possible while buying our necessary items. If it’s not obvious yet, Amazon’s gift registry program was an absolute godsend. It really was the most convenient and easy way to handle our registry, and I would do it again in a heartbeat if I had to do it all over. Now Go Build Your Household Together! That’s pretty much all there is to it! It’s not wildly difficult to fill up a registry, but don’t underestimate how much time and energy it will take. Slow and steady, my friends. You will have to pick out items together, so it requires compromise and patience. You will need to give your guests adequate selection, so you will need to add many more items than you probably need, But above all, it will be fun if you don’t try to rush it. 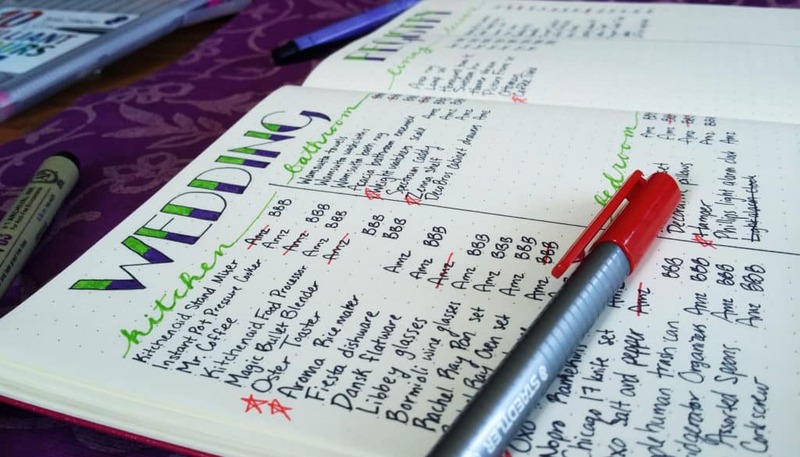 So use your bullet journal to decide what you need, what you have, and what you want, then track it all.